Nominate staff members for 2018-19 openings. 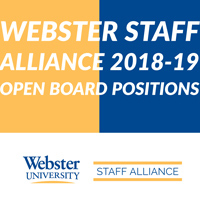 Webster Staff Alliance (WSA) is requesting nominations for full-time staff at the Webster Groves, Missouri, location for 2018-19 open board positions. WSA will be holding elections for Associate Chair, Compensation Chair, and Associate Special Events Chair. Time commitments include two meetings per month (one with the WSA Board, and one with University Leadership) and special events as needed. Learn more about WSA board openings and the nomination process here: www.webster.edu/wsa/elections.html.